It is her 15th birthday and Speth is nervous about delivering her Last Day speech that will lead to her endorsements and adulthood. Once you have given your speech, every word you say and every gesture you make costs you money. All communication is owned by someone and you must pay the copyright owner to use the words and gestures. Some basic words don't cost much but other words can be very expensive and must be avoided. Speth's family is split up and in massive debt because her parents are working off a debt from an ancestor who downloaded music illegally. But when it is Speth's time to deliver her speech, she doesn't say anything at all. Her defiance at this important ceremony leads to lots of consequences for her family and ignites a resistance while also making her some powerful enemies. 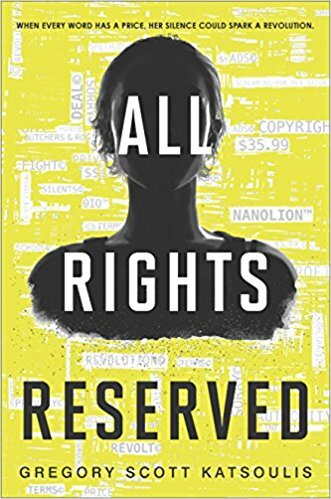 I am fascinated with copyright law so when I read about this book I was caught up in the premise and ordered it up immediately. As usually happens, media that has raised my expectations often ends up being a disappointment in the end. The idea everything being copyright protected doesn't seem that far-fetched so I was totally along for the ride at first, enjoying the insta-lawsuits and thinking carefully about how I would weigh my words in this world. But things began to go south for me as the book went along. I think the author took on a difficult task by writing a protagonist who cannot speak. We are privy to her thoughts, so that's helpful, but it's still hard to move some plot lines forward without any communication with other characters on her part. One of the biggest issues I had was her unwillingness to speak even at times when she could or at times that, to me, seemed necessary. Her zipping of her lips was not done purposefully to take a stand, it felt more like an impulsive action when she was overwhelmed by all that had happened right then. As such, she was sort of drifting along and became the symbol of a revolution she hadn't planned. I was shaking my head more than once about her continued silence and the consequences of it.